One of the Fortnite Battle Pass challenges for Season 7 Week 4 involves restoring a classic piece of Fortnite scenery - namely, the NOMS store sign in Retail Row. Scattered across the island by rifts in previous seasons, it's now up to you to find all four Fortnite letters so they can be reassembled and restore NOMS to its former glory. Each stage of the weekly challenge points you to an area where the letter is located, but some of them are hidden pretty well and can be tricky to track down. Here, we'll show you exactly where you need to look, so you can get the challenge wrapped up in no time. To get started, head to the abandoned house west of Pleasant Park, then look behind the pile of trash outside. You'll find the 'O' in the corner of the alcove, next to the dumpster. To collect the second letter, you need to make your way into the bunker below Wailing Woods which can be accessed through the shaft in the middle of the maze. Once you've dropped into the bunker, go to the side room to the north where you'll find the 'S' behind a door. To get this letter, aim for the southeast corner of the building complex in the middle of Dusty Divot. There you'll find a small separate block, and the 'M' is sat inside within one of the side rooms. For the final letter, you need to return to the area that was once Greasy Grove, but is now submerged below the frozen lake north of Polar Peak. In the middle of the lake is the roof of one of the old stores, and if you break down through it you can access the intact interior to find the 'N' in the corner by the counter. 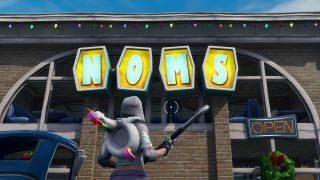 With all four of the letters collected, you just need to return to the store in the northeast of Retail Row, where the NOMS sign has been returned to its former glory. Approach it to tick off the final stage, and you'll have another weekly challenge in the bag. Looking for more help with Fortnite Season 7 Week 4? Then we also have guides for where to find the Fortnite expedition outposts, and where you can launch the Fortnite fireworks.